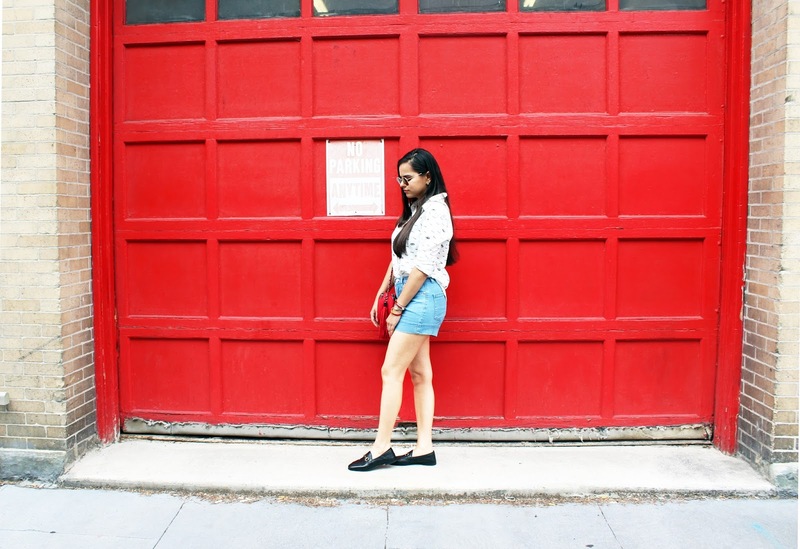 Miss Singh: HOW TO STYLE YOUR DENIM SHORTS THIS SUMMER! HOW TO STYLE YOUR DENIM SHORTS THIS SUMMER! I am all about my denim shorts in the summer time. I literally live in them throughout summer. They are comfortable and can be styled with so many fun pieces! I want to share how I am styling my shorts this summer. I wanted to dress this look up a little more but still keep it as "me" as possible. I love dressing up and dressing down my favorite denim shorts, but I styled this look to be a mix of both. For me, one of the simple formulas for creating a more put together look is adding a few classics to something super casual. Firstly, I decided to pick a classic crisp white shirt with a unique pop of graphic eyes and lashes which helps create a classic but cool look. Don't forget to tuck your shirt in like I did here! The shirt adds so much detail and character without being too out there. I paired my gorgeous black Gucci loafers that I absolutely love and my bright red bag that is very summer appropriate. I love the round shape and the big tassel detail. This outfit is appropriate for brunch or casual drinks with friends.